A vacation week is time for reading--perhaps for you, too. And I mean real, physical books that you hold at the beach or in a lawn chair or in bed late at night! This year I've found a new mystery, thriller series. As usual I'm coming in after over a dozen books have already been published, but that doesn't bother me! After reading the first one I've come upon, I just circle back and start at the beginning of the series and work my way to the present. The author is Daniel Silva, his series began in 1996 and the books have been New York Times best sellers ever since--seven reaching #1. His "hero" is Gabriel Allon, an Israeli art restorer, spy and assassin. I enjoy the thriller/mystery part but I also enjoy books that expose the reader to other things on the sidelines--in this case the world of art restoration and the life of Jews in Israel. 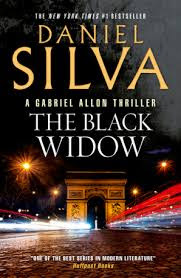 So if you're a mystery buff and would like to see if you take to this new series, give Silva's fascinating character, Gabriel Allon, a try.